Prosecco by Dal Zotto Estate of King Valley. In the mouth it is soft, yet at the same time dry thanks to its good acidity. If ever there was a wine to counter the conventional wisdom, it must be Dal Zotto Estate Prosecco, the fun and fizzy Italian sparkling wine from the King Valley. Australia has borrowed Prosecco from the Italians. This wine from the Dal Zotto family is austere, subtly flavoured and has a finish as dry as a wind-blown leaf. A traditional high-walled Italian town of stone houses and citadels surrounded by mountains, Valdobbiadene is a region renowned for wine-making. Owing to its generous soil and mild climate, vines hundreds of years old blanket the landscape. It is here that Ottorino Dal Zotto was born and raised on his family’s vineyard. The love of viticulture, appreciation of fine wine and dedication to the highest standards was instilled from an early age, his education steeped in the practices of traditional Italian winemaking. And so began Otto’s lifetime passion. With little else but a dream, determination and a sense of adventure, Otto packed his bags in search of the opportunities awaiting him in Australia. It was 1967 and like many Italian migrants before him, Otto migrated to Victoria’s King Valley in the foothills of the Victorian Alps in north-east Victoria. It was a taste of home; a stunning valley of rolling hills, fertile land, mild climate and an Italian agricultural heritage. Otto and his wife Elena used their agricultural experience to grow tobacco as share farmers until shrinking demand for tobacco and the introduction of the Tobacco Stabilisation Scheme bought about the decline of the local industry. With the purchase of their first property in Cheshunt 1987 came the exciting opportunity for Otto to return to his heritage. The couple planted Chardonnay, Merlot and Cabernet Sauvignon vines on their new property and Dal Zotto Estate Wines was born. The winery first began as a contract supplier of premium quality grapes to larger wineries. The ideal conditions the winery enjoyed in the King Valley and Otto’s viticultural background meant our grapes were in high demand. At the same time the King Valley, once the heartland of tobacco production in Australia, was emerging as a renowned vine growing region. With time, Otto put his own winemaking skills to work using the best of the traditional Italian methods alongside some of the modern techniques Australia had to offer. Dal Zotto’s highly regarded Shiraz, Cabernet Merlot and Riesling were the impressive results. With the expansion of the winery in 1994 came the opportunity for Otto to take the path less travelled and he decided to introduce Italian varietals into the vineyard – Barbera, Sangiovese, Pinot Grigio, Prosecco, Arneis. All of which are perfectly suited to the winery’s terroir. 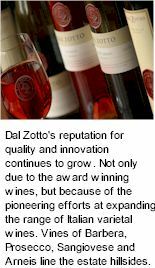 Dal Zotto Estates had become pioneers of Italian varieties in Australia. The unique characteristics of Sangiovese, Barbera and Arneis are appealing to more and more wine consumers. The release of Prosecco (a dry, sparkling wine) for the first time in Australia is typical of Dal Zotto Estates commitment to both innovation and to honouring the family's heritage. Dal Zotto Wines recently relocated their Cellar Door to the centre of Whitfield, at the same time building Rinaldo's of the King Valley Restaurant. Built in the early 1950s, the refurbished Cellar Door originally served as the Whitfield Police Station. Rinaldo's of the King Valley is operated by Otto and Elena's nephew, Adam Pizzini, who delights in sharing the family history of traditional Italian hospitality centred around the table. The restaurant sits next to the old Cellar Door in one of the farm's original tobacco sheds - the corrugated iron tobacco sheds and kilns are a major part of the King Valley landscape and offer a reminder of the region's recent agricultural history. Adam Dal Zotto's menu features the best of local produce assembled into dishes with a delicious Italian accent. The kitchen garden next to the restaurant provides seasonal inspiration, especially through the blackboard of specials that change daily according to the available flavours. The menu works beautifully with a wine list that features many options including the Dal Zotto Estate range of favourites - hard to go past wine and food combinations made from ingredients you can see out of the window...but that's the King Valley for you. With an array of awards and accolades, the appreciation of wine lovers both in Australia and overseas and the good fortune to be living the dream, the Dal Zotto family look set to move forward with great enthusiasm into a promising future. A second generation of Dal Zotto’s have now dedicated themselves to this vision. Eldest son Michael has added a youthful element to the winemaking process by joining Otto as winemaker. Christian takes care of sales and marketing, making sure as many people as possible experience the fruits of the family’s labours. Not to be outdone, matriarch Elena Dal Zotto excels in whatever she puts her hand to – her gardens are stunning, her hospitality is legendary, and her sales record in the cellar door is the envy of the rest of the family! Together the Dal Zotto's are working to grow the best grapes and produce the most outstanding wines they can. And at the end of each day, to sit down together and share a bottle of wine that they are all proud to have made.